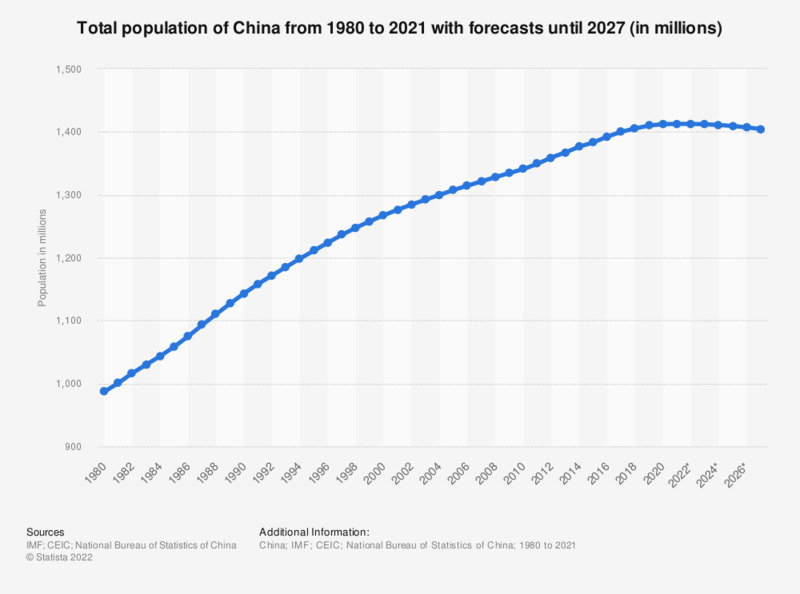 The statistic shows the total population of China until 2017, with forecasts until 2023. In 2017, the Chinese population amounted to about 1.39 billion. See the figures for the population of South Korea for comparison. The forecast as calculated by the IMF is based on historical population data provided by the CEIC. As of mid 2012, China was the country with the largest population worldwide, about 90 million more inhabitants than India, which ranked second with a population of about 1.26 billion people. Due to several mechanisms put into place by the Chinese government as well as changing circumstances in the working and social environment of the Chinese people, population growth has virtually subsided over the past decade. Displaying a 0.49 percent annual growth rate in 2012, population growth in China ranks among the lowest worldwide. Nevertheless, compared to the world population in total, China held a share of about 19 percent of the overall global population in 2010. In terms of demographic developments, the birth control efforts of the Chinese government, most prominent among them the controversial one-child policy, have facilitated a considerable imbalance of the demographic pyramid in China. Upon closer examination of the age distribution, a clear trend of an aging population becomes visible. Under the strict birth control regime, the desire of parents to have a male child has resulted in an increased rate of abortions, which in turn has gradually shifted the ratio of male to female population towards males. As of 2012, a ratio of 118 males to 100 females in the age group of 0 to 4 year-olds has been reported.